Should my dog wear a muzzle? This is a question I get a lot. And it usually comes from people who really, deep down, know the answer. They just can’t bring themselves to take this step. So first off - if your dog has bitten anyone or anything, or you fear he may bite - have sense and muzzle-train him. This is not only for safety, but also for the health of your heart-rate and possibly your bank balance, if things go badly wrong. There are many useful occasions for a muzzle - a vet or groomer visit for an anxious dog is one. Far better for your dog to be used to his muzzle and arrive already wearing it, rather than be man-handled by staff putting a strange one on him. Then there’s the slug-muncher and stone-eater - and harvesters of other unmentionable stuff that some dogs take a fancy to! Rather than try and catch him and nag the whole time, just prevent it. Join our free 5 Day Workshop for your Growly Dog! THIS FREE MINI-COURSE IS A BONUS FOR YOU WHEN YOU SIGN UP TO RECEIVE EDUCATIONAL EMAILS AND OCCASIONAL OFFERS FROM ME. YOU CAN UNSUBSCRIBE AT ANY TIME. Some dogs can cope with people outside the house, but visitors inside the house terrify him. Give yourself and your dog a break by muzzling him before your guests arrive. Once you relax a bit because you know your friends and family aren’t going to be shredded and spat out on the carpet, your dog will have a better chance of relaxing too. Of course the dog must be happy to be there - not just forced in on the basis that he’s no longer dangerous! But people will think my dog is nasty! Maybe they will. Maybe they won’t. (Maybe they do already.) If they’re strangers, do you really care? And if they’re friends, you can explain to them. One surefire thing about a muzzle is that it tends to keep people away - which is just what you want! They think your dog must be dangerous and therefore move their dogs and children aside, as well as themselves. It doesn’t seem to occur to them that your dog is actually the safest of all now! But this is a good outcome. Your anxious dog doesn’t need people/children/dogs in her face. If you feel anxious yourself about muzzling your dog, think how you’ll feel if you relax your vigilance for a moment and your dog bites someone! Would that be worse? Definitely. Bite the bullet and just do it. What sort of muzzle should I get? There’s quite a variety of muzzles available. • Cloth muzzle: this is the sort that vets may put on a dog for a few moments while they treat her. It should never be on for long - or be put on an unsupervised dog - as it prevents the dog from panting or drinking, and is therefore dangerous. It’s also not advised for brachycephalic dogs (squashed-nose dogs, so popular at the moment) as they already struggle to breathe and these cloth muzzles have proved fatal in some cases for these dogs. So on no account get this one! • Basket muzzle: what you need is a basket muzzle that allows your dog to open her mouth fully, to eat, drink, pant, and not feel constrained. But these vary hugely, and you need to get the right one for your dog. • Baskerville muzzles: perhaps the commonest. They don’t allow full opening of the mouth. The inability to pant could have serious consequences for a dog who needs to lower her body temperature. • Baskerville Ultra muzzle: is often the go-to muzzle as it’s widely available. But this doesn’t mean it’s the right one for your dog! They have an optional head-strap which can be useful for keeping the thing on, but they are really designed for brachycephalic dogs and are too short for longer-nosed dogs. See Lacy in hers. She hated it - you can see that in the photo. Any larger and it would have fallen off her face. • Leather custom-made colourful muzzles: very expensive and they look pretty constricting to me. It looks hard to get treats in at the right moment (essential if you’re working on counterconditioning an anxious or fearful dog). But I know some people like them. • Racing greyhound muzzle: my favourite, and the one Lacy is wearing in the other pictures. Made to measure, available in loads of colours, incredibly lightweight, it allows full opening of the mouth for even a gasping racing dog, treats are easy to administer, and most important - Lacy is very happy to wear it. She comes forward and puts her face in, as opposed to running and hiding as she did when she saw the Baskerville Ultra. 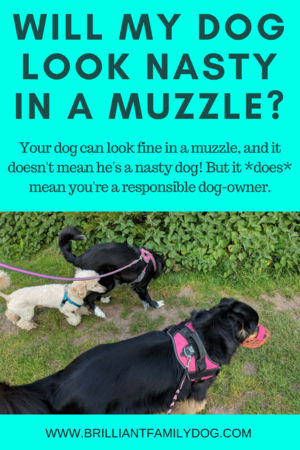 Bottom line: your dog should find the muzzle comfortable, it should be easy to slip on, secure, and allow your dog to drink, pant, eat treats, and possibly play. They don’t need to be! You can decorate your dog’s muzzle any way you like. You can see I “girlified” Lacy’s black muzzle, and I’ve added a little fleece to the top of her pink racing muzzle in case it chafed. It never did, but I felt it was kinder to cushion it as sometimes she will be wearing it for a couple of hours at a time. You can use paint, stickers, ribbons, sparkly stuff (make sure it can’t flake into your dog’s eyes or nose) - anything that shows that your dog is loved. I tried a muzzle once and my dog hated it and kept scrabbling at her face! Wouldn’t you? If someone slapped a cage on your face without asking? Just as with any bit of dog gear - harness, collar, coat - you have to acclimatise your dog to this slowly. The idea is to associate the new thing with a steady flow of treats until your dog can’t wait to put her nose in! Start by treating her for just looking at it; then for sniffing it, then for touching it with her nose … and so on. Those three steps alone may take you three days or more! Go at your dog’s speed, don’t try to rush. The key is that your dog should always have the choice to move forward to interact with the muzzle. You’re not grabbing her and whamming it on! There is an excellent how-to video in the Resources below. Do watch it then work through it step-by-step. Once you’re at the stage of putting the muzzle on before a walk, your dog will associate it with treats and a walk. This is the perfect ending - as long as your dog likes walks! If not, then have a look at some of the other Growly Dog posts here. There is no stigma in being a responsible dog-owner! Don’t think you are appearing a bad owner if your dog is wearing a muzzle! You are being a responsible owner! You are acknowledging that your dog has difficulties in certain areas of her life and you are aiming for the best possible outcome. Never be ashamed of this. Muzzling your dog may allow him valuable off-lead time. This does depend on the level of his anxiety and the amount of behaviour modification training you’ve put in place. You must always think safety first. As you can see in the photo, a group walk can be made possible for a muzzle-trained dog. Ensure your dog is happy with the space between her and the other dogs so she doesn't feel trapped. And it doesn’t mean the end of fun for your dog! I know dogs who wear the same muzzle as Lacy who can still play with their beloved toys as they can press down on the ground and get a grip on its “handle”. So a ball on a rope is the ideal solution for the toy-mad dog who needs to wear a muzzle. Store your dog’s muzzle in a prominent place near your leads and harnesses. Put it on your dog proudly! Be glad of how much relief it brings you. And know you’re doing the right thing. Free 8-part email course for your Growly but Brilliant Family Dog! Tagged: dog muzzle, dangerous dog, dog biting, dog bites, dog eating stones, dog scavenging, muzzle for dog, reactive dog, shy dog, dog afraid of people, dog barks and lunges at other dogs, decorating a dog muzzle, what type of muzzle?, which muzzle is best?